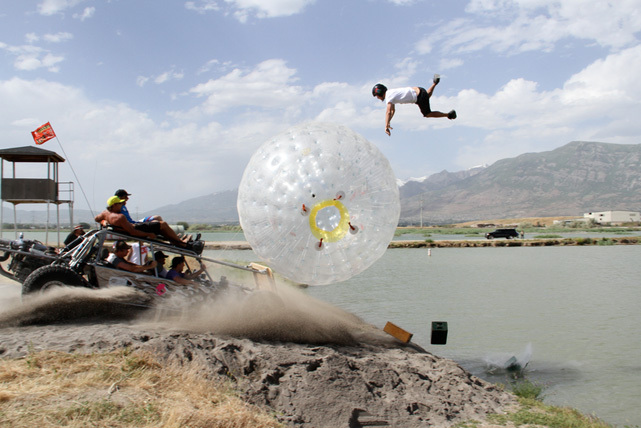 In 20 years or so, "extreme" sports have gone from being entertainment for the teen fringe of society to a multi billion dollar industry where sponsorship dominates, proving that it has finally hit the mainstream. 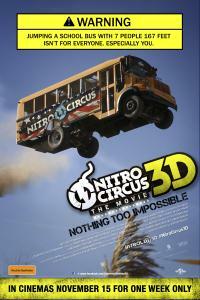 Welcome to Nitro Circus 3D. Nitro Circus, lead by the charismatic man-child Travis Pastrana, are a rag tag team of adrenalin junkies who appear to live for the moment, putting their life on the line for the thrill of it and your entertainment. In the beginning, there were the Crusty Demons of Dirt, a bunch of freestyle motocross riders who almost began as outlaws, the bad boys of the sport and the trailblazers of the FMX scene. Soon after came the X-Games which reigned in these bad boys and gave them an international stage on which to impress. So soon after, when the extreme had become profitable, MTV's Jackass took it to another level and showed that people are willing to pay good money to see other people do stupid things, stupid things that get them hurt. Now, as somewhat of a hybrid between Crusty Demons and Jackass, we have Nitro Circus. 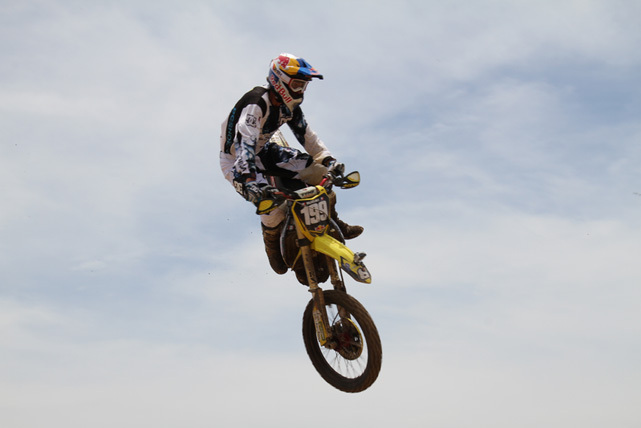 An adrenaline pumping freestyle motocross franchise which aims to excite and delight without resorting to puke and poop. In NITRO CIRCUS THE MOVIE 3D, Travis Pastrana and his tight-knit, highly-skilled, adrenaline-addicted friends bring their impossible, ridiculous, insane and hysterical adventures to the big screen for the first time! Dreaming up the most dangerous stunts in the world of action sports - whether they are trying to back flip a bike over a building 60 stories high or landing a death-defying stunt while playing Angry Birds - Travis Pastrana and his gang are always at it. High risk. High octane. And no safety nets allowed. While somewhat of a lovechild between Crusty Demons and Jackass, Nitro Circus far surpasses both in so many ways. In the very first scene, we are shown just how serious Nitro Circus has become. No longer were the Nitro crew content with handy cams and amateur cinematographers, they've pushed to high def 3D in the most impressive opening sequence of any movie released in 2012. Considering that it is his first post as the cinematographer on a feature film, Donny Anderson nailed it. The initial scene shows a handful of bikes, a handful of buggies, a chopper and a monster truck jumping between each other, criss crossing mid air like death defying ballet. This sequence is super slick and takes full advantage of the use of 3D. While watching in slow motion you can see buggies pouncing over each woop, spitting up loose dirt and rocks which are flung towards the screen. Nitro Circus 3D is a true action film in every sense of the word although you won't find a single bad guy among the bunch. What you do find are a gaggle of action heroes and larger than life characters who don't have the luxury of second takes. If one of their stunts go wrong they're looking at some serious hospital time or worse. In fact, there is one particular stunt in the mix that doesn't go according to plan, adding dramatic pause at the expense of potentially life threatening injuries. What these people do is not a game, it could truly be life or death. This is what sets the Nitro Circus apart from what has come before it, heart. It's in scenes like these that you are shown the true ramifications for pursuing a calling that pushes the limits of the human body. In doing so, you see the overwhelming joy of success and the crushing (sometimes spine crushing) taste of defeat and it's in these moments particularly that the crew come together as a family. Without this aspect to the film, it would be nothing more that another, albeit far better produced, Crusty Demons. Nitro Circus 3D is a must see for fans of freestyle motocross, bike fans and generally anyone else who enjoys incredible action and feats the border on superhuman. It is wonderfully shot and gives every other action movie of 2012 a run for their money. After growing up riding dirt bikes, I was left tempted to buy another bike after watching this film. I decided that it would be a bad idea - especially after I pulled a muscle in my back while getting out of my chair at the end of the film. 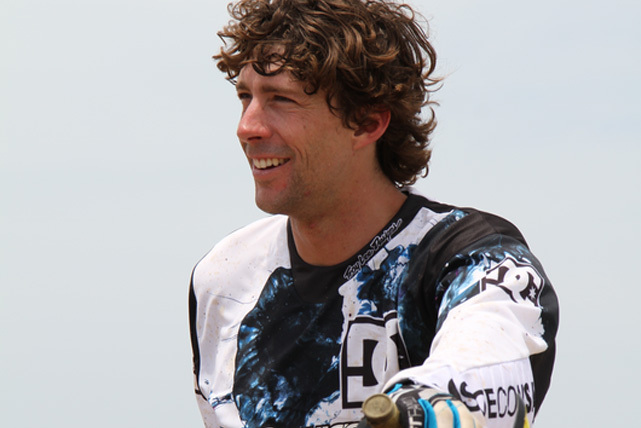 I'll leave the awesomeness to the real action heroes, Travis Pastrana and the Nitro Circus crew. Screening for ONE WEEK ONLY from November 15th, Nitro Circus 3D will be screening at the following cinemas so get on your bike and check it out.